Bohan chronicles a bold experiment to challenge this inequity. The California Endowment, one of the nation’s largest health foundations, is upending the old-school, top-down charity model and investing $1 billion over ten years to help distressed communities advocate for their own interests. This new approach to community change draws on the latent political power of residents and is driving reform both locally and in the state’s legislative chambers. If it can work in fourteen of California’s most challenging and diverse communities, it has the potential to work anywhere in the country. Bohan introduces us to former street shooters with official government jobs; kids who convinced their city council members to build skate parks; students and parents who demanded fairer school discipline policies to keep kids in the classroom; urban farmers who pushed for permits to produce and sell their food; and a Native American tribe that revived its traditional forest management practices. Told with compassion and insight, their stories will fundamentally change how we think about the root causes of disease and the prospects for healing. "This book is filled with superheroes! Daring people who refused to watch their neighborhoods be plagued by avoidable and unjust inequities. Their stories provide a powerful blueprint that should inspire all of us to fight for justice and inclusion." "Must reading for anyone who cares about our nation's future. With thoughtful reporting and judicious use of data, Suzanne Bohan shows us where hope lies—with everyone committed to making change happen." "Bohan provides such great and humane insight into the many ways in which neighborhood environments can conspire against good health. Even more importantly, she shows how communities can come together to build a better life. I found these stories both angering and inspiring." "In Twenty Years of Life, Suzanne Bohan shows how trauma, both structural and personal, works as a primary catalyst for the inequities experienced by poor people and people of color. Who among us will have the courage to respond with the urgency required? We are all on the clock..."
"In this slim but powerful volume, Suzanne Bohan takes us on a remarkable journey of discovery. With the skill of a researcher and the flair of a journalist, she charts how the field of public health came to understand that where you live is critical to your health—and explains how a California foundation came to believe that the only way to really alter those social and environmental determinants of well-being is to support grassroots power-building. As with many such paths, there are delightful surprises along the way—as when young people convince the foundation's board to invest in campaigns to alter school discipline policies or when the city manager of a town with a troubled history of police-community relations embraces the need to address systemic racism. In a nation wracked by division, polarization, and often inaction, these stories of listening, healing, and transformation offer a glimmer of hope for change. This is a compelling, important, and timely read." "This is a remarkable book. It tackles, head on, one of the most perplexing problems of our time: why do Americans have poorer health than the residents of 40 other nations even though we spend much more money on healthcare? Could the reason involve more than medical care? Suzanne Bohan demonstrates how lack of access to good schools, housing, parks, food, and community support can influence our health. And she shows what can be done about it. This is a much-needed book that reveals our true health problem and offers real-life examples of how to solve it." In the book, Twenty Years of Life, author Suzanne Bohan explores the disturbing flip side of the “American dream”: your health is largely determined by your zip code. The strain of living in a neighborhood with sub-par schools, lack of parks, fear of violence, few to no healthy food options, and the stress of unpaid bills is literally taking years off people’s lives. The difference in life expectancy between wealthy and distressed neighborhoods can be as much as twenty years. In response to this inequity, The California Endowment, one of the nation’s largest health foundations is upending the old-school, top-down charity model and investing $1 billion over ten years to help communities advocate for their own interests. This new approach to community change draws on the latent political power of residents and is driving reform both locally and in the state’s legislative chambers. If it can work in fourteen of California’s most challenging and diverse communities, it has the potential to work anywhere in the country. Please join the Aspen Institute’s Forum for Community Solutions program for a discussion of how these communities are creating change and tackling the root causes of health inequities. There are lessons for all stakeholders from policymakers, philanthropy, and community leaders to learn how investing in the power of communities can create smart solutions and positive change. Event will be taped and available for viewing. Suzanne Bohan spent twelve years as a reporter for the Bay Area New Group, which includes the San Jose Mercury News, Contra Costa Times, and Oakland Tribune. She won a prestigious White House Correspondents’ Association award in 2010 for her reporting on health disparities. Bohan is co-author of 50 Simple Ways to Live a Longer Life: Everyday Techniques From the Forefront of Science. In Twenty Years of Life, award-winning health journalist Suzanne Bohan shows that it’s not a lack of medical care or poor lifestyle choices behind much of the ill health and shortened lives in impoverished communities, but a dearth of political power. She illustrates why the most effective solution for improving health actually hinges on preventing disease in the first place. To help create equitable places that support longer lives, poor communities can get politically organized to demand the same health-supporting resources and policies that wealthier areas take for granted, including well-maintained parks, safe streets, quality schools, and grocery stores. Drawing from years of on-the-ground reporting, Bohan brings the impact of this new activism to life. With dozens of profiles of courageous and determined community residents and leaders tackling a wide array of topics, she details success stories with lessons for communities across the nation. As one public health expert wrote, "This book is filled with superheroes! Daring people who refused to watch their neighborhoods be plagued by avoidable and unjust inequities." Read our conversation with Bohan below, and share your questions in the comments. Seven years into the 10-year campaign covered in the book, California has seen the passage of more than 500 new policies in 14 communities, and some statewide. How are the impacts of these policies measured? In other words, have these communities seen actual change? The changes you’d ultimately want to see in these distressed communities include lower rates of diabetes, heart disease, obesity, cancer, hypertension, depression, and other common chronic diseases, along with increased life expectancies. However, as you can imagine, that takes time, as the youngest generation enters adolescence and transitions to adulthood. These diseases are hard to reverse, and prevention through better living conditions yields the most powerful results. The leaders of this California campaign don’t expect to see communitywide reductions in disease and early mortality for perhaps another decade, although possibly a few years earlier. They liken it to the campaign to reduce lung cancer rates by reducing tobacco use, through laws limiting smoking in workplaces and public venues, taxation on tobacco products, public education campaigns and so on. No one expected an immediate decline in lung cancer rates, but in the years after these campaigns began, they did start dropping. To keep an eye on changes in disease rates and longevity in these 14 communities, the campaign leaders are working with the University of California, Los Angeles, which conducts the “California Health interview Survey” (the largest state health survey in the nation), to include a few questions to monitor community-wide changes in the coming years. And there are already changes underway in these communities that are visible to many of those living there, creating a sense of positive momentum. Is there a particular story in the book that stands out to you? There are many, so it’s hard to choose. I met with many heroic individuals determined to challenge inequitable systems. This campaign actually bolstered my faith in the prospects of some degree of increased citizen engagement in the country—and every increase helps. I was also deeply impressed by the strength of the people living in these distressed communities, who persevere through challenges others in more comfortable neighborhoods scarcely, if ever, encounter. That said, the story of Pogo Park, led by Toody Maher, is extraordinary. She was utterly committed to turning a small city park in a notoriously dangerous neighborhood—a park few used because of illegal drug activity, loose dogs that terrorized kids, and vandalism and litter— into an oasis of peace, beauty, and enjoyment. Against all odds she succeeded, and her revolutionary vision of harnessing the skills and commitment of residents living around the park to make it happen—because they’re deeply invested in its success, and compensated for their work—transformed that neighborhood. It’s truly a national model. The last chapter in the book describes striking and consistent differences between how Democrats and Republicans relate to issues of health disparities. How can community groups use this information to effectively lobby their representatives—federal, state, or local—for meaningful policy change? Very few are aware of this one-of-a-kind study I reported on regarding the different perspectives Democrats and Republicans hold on the reasons for wide gaps in health and longevity between US communities. To my knowledge these ideas have been tested in only limited ways in the policy arena, so one reason I covered this report is to better inform this dimension of the debate going forward. As described in the chapter, however, one of the report authors advised those leading campaigns to reduce health disparities to use the same message with both conservative and progressive audiences, rather than two separate messages. He advised appealing to Americans’ fundamental sense of fairness, and how most people understand that “where you live, learn, work, and play” will have an influence on your health. He suggested using stories and “colloquial, kitchen-table” language, and to avoid stuffy academic terms like “social determinants of health” (which people especially disliked) or even “health disparities.” And to include a message of personal responsibility for health, but woven in with the notion that people should have the same opportunity to make healthy choices. The communities you profile in the book have received millions of dollars in funding since the Building Healthy Communities campaign launched in 2010. What is the importance of this type of intensive, long-term investment? It makes all the difference, as the outcomes of these investments typically last decades and benefit generations. In City Heights, a low-income San Diego neighborhood, teen advocacy under this campaign created two new skate parks in an area which previously had none, funded with a few million dollars in grants. Remarkably, in Fresno, community organizing under the campaign ushered in a $75 million community revitalization plan, which is expected to transform a distressed neighborhood with a high disease burden and uplift living conditions far into the future. Sustained advocacy by community activists, parents, and students has funneled many millions of dollars into the state’s schools to fund practices to promote peaceful, productive school climates and parental engagement, along with accountability to ensure these practices are actually implemented. These critical changes help students learn and graduate, and ultimately head into successful careers and healthier lives. And these health-supporting policies are expected to become entrenched in school systems going forward, again benefiting future generations. What lessons can other communities learn from the success stories in the book? Can residents expect to affect real change in their neighborhoods without substantial financial support? Why or why not? They can, and there are examples such as the Dudley Street Neighborhood Initiative, which began more than three decades ago and has made extraordinary changes in its Massachusetts community. However “substantial financial support” is relative: according to the most recent annual report on its website, Dudley Street brought in nearly $4 million in 2015, so it was hardly insubstantial. But that compares to $1 billion over 10 years for the California campaign—an unprecedented commitment by a foundation to this type of work. So some funding is critical for a sustained endeavor, and one of the messages of this book for the world of philanthropy is that this model is showing major success in “funding change, not charity.” An outside funder brings numerous benefits as well, such as providing a “neutral convener” to aid numerous community groups in developing a unifying vision for action, and of course the resources to run a sustained campaign, with staffing, office space, and funds for supplies, media campaigns, research, etc. However, there are innumerable examples of campaigns with no budget—typically shorter-term but not always—that have led to lasting change. So if citizens recognize a pressing issue facing their community, they can take some of the examples in this book (or one specifically on community organizing) on how to run a campaign—which includes thorough, accurate research, reaching out to those in a bona fide position to influence, holding tightly-run public meetings to build credibility and support, etc.—to create change with few or no expenditures. And people commonly describe attaining a new sense of power and optimism by participating in these efforts, along with better community or school conditions and a greater sense of connection to neighbors. And building power is in fact what these endeavors must achieve, as that’s ultimately what causes those in positions of influence to shift their position—be it releasing resources, enacting a new policy or law, etc. 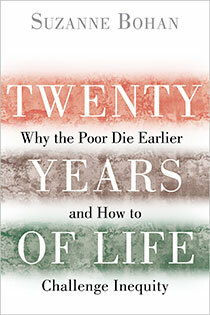 What do you hope readers take away from Twenty Years of Life? That within these distressed communities around the nation—the ones often labeled as “bad neighborhoods”—there’s a deep reservoir of talent, goodness and latent power. That’s commonly overlooked, and those living in these neighborhoods often bear the extra burden of unwarranted, offensive stereotypes. And that rather than concentrating on charitable programs to help these communities, a smart investment is in building up their political power, so residents can advance their visions for a healthier community and drive sustainable change by cultivating long-term local empowerment. And that in fact the entire nation benefits, as when these horrific disparities between communities in something as fundamental lifespan and disease burdens begin to shrink, it’s likely to lead to a more peaceful, less stressful society for all. A Changing Climate Means A Changing Society. The Island Press Urban Resilience Project, Supported By The Kresge Foundation And The JPB Foundation, Is Committed To A Greener, Fairer Future.​ This Article Was Originally Published August 3, 2018 in Nonprofit Quarterly. After the mass shooting at a high school in Parkland, Florida earlier this year, schools are at the epicenter of national debates on gun violence and mental health. How can teachers and administrators deal with troubled students? And how can they make schools safer for all? It’s not the first time that schools have been asked to address social problems that originate far outside their hallways. In a nation where more than 40 percent of kids are from low-income families, school teachers and staff regularly cope with problems far larger than algebra equations. Too often, their students are hungry, in need of medical care, traumatized by domestic violence, fearful of gangs, and living with perilous housing security or homelessness. Distressed kids act out their troubles in school, and overworked teachers often double as social workers. Now, post-Parkland, some have called on us to “harden” our schools. President Trump and others have advocated arming teachers and recruiting former police and military personnel for school duty. The National Rifle Association is promoting its plan to re-envision schools as windowless bunkers surrounded by impenetrable fencing. But it is not necessary to model our schools after prisons. There are ways to create safe, nurturing schools where kids can learn, even in the face of extreme poverty and social challenges. Just ask Godwin Higa, the former principal of Cherokee Point Elementary School in the City Heights neighborhood of San Diego. Under Higa’s leadership, in 2015 Cherokee Point officially became a “trauma-informed school”—a model that proved so successful, the San Diego school board expanded it districtwide. The elementary school is now a place where everyone from the principal to the school custodian seeks to understand and heal the difficult experiences that cause kids to act out. It’s an approach that calls for revised disciplinary practices, social-emotional instruction, school-wide training about trauma, strong parental engagement, and intensive individual support where needed, as well as partnerships with community organizations to support these efforts. Those partnerships, in fact, were crucial to the endeavor’s extraordinary outcome, which wouldn’t have been possible without support from local nonprofits. The success in San Diego in codifying a culture of care on K-12 campuses affirms the growing call in the civic sector for nonprofits to explore more partnerships with school districts to leverage resources and launch programs with staying power. Trauma-informed schools were inspired by the American Journal of Preventative Medicine’s groundbreaking 1998 Adverse Childhood Experiences (ACE) Study, which found devastating long-term effects from traumatic experiences such as abuse, neglect, and close encounters with substance abuse and domestic violence. The ACE Study and subsequent research found that the toxic stress of childhood trauma can actually damage the structure and function of a child’s brain. In this way, trauma can contribute to a range of problems, from poor school performance to violence, risky behavior, and early death. Such trauma is distressingly common. The National Survey of Children’s Exposure to Violence reports that nearly 60 percent of American schoolchildren have been exposed to violence in the past year, with more than one in ten reporting five or more exposures. Many of the nearly 600 students at Cherokee Point have experienced trauma in the form of strife at home, fear of their parents being deported, and neighborhood violence and crime. But this K-5 school is an oasis of calm—and not because the perpetrators of misbehavior have been banished. When a student at Cherokee Point acts out, punishment is not the first response. An administrator or teacher will likely ask, “What happened to you?”—not “What’s wrong with you?” As Higa explains, “When you ask, ‘What’s wrong with you?’ it’s totally negative right away, versus ‘What’s happening to you, you don’t seem right.’ As soon as we say that, the kids look at you like ‘How did you know that I’m feeling down today?’” When they’re done talking, usually the child feels better and returns to class, the disruptive behavior occurs less often and generally fades away after a few more talks, and a trusting bond is formed, he said. Higa, who has a kindly smile, warm eyes, and close-cut black hair turning gray, said his own difficult childhood animated his compassion for children dealing with adversity. Even though he was just two years old, he still distinctly remembers a dish thrown against a wall in anger the same year his parents divorced. He grew up in Hawaii, on his grandfather’s hog farm on Oahu, and money was always scarce. His father left his life after the divorce, and his mother died when he was sixteen. Those early experiences informed Higa’s approach as an educator. Even before he heard about trauma-informed schools, Higa made a commitment to educating the “whole child”—understanding students’ social and emotional worlds in addition to their academic needs, and substituting empathy for harsh discipline. When Higa joined Cherokee Point as principal in 2008, stacks of discipline referrals from teachers and other staff awaited him. Under the traditional system, those often led to detention, suspension, or even expulsion. That first year, he suspended seven students, not too high a number, but more than he was comfortable with. So, over the objections of some teachers, Higa took a new approach to discipline. Rather than being sent home, a student who acted out might be asked to sit out recess and contemplate misbehavior. Higa also instituted a restorative justice approach, in which any child causing harm to another acknowledges it and makes amends. For example, a teacher called Higa to a classroom after a girl began throwing chairs. He surveyed the chaos and then assured the girl that although the classroom was a mess, it could be cleaned up. What was important, he told her, was that he wanted to know what was going on with her. He left the classroom with the agitated student and took a walk with her around the campus while she described what was distressing her. Higa said he told her he understood that people have bad days and asked her to think about it before she did something like that again and contact him if she felt she might. He explained, “If you feel you’re going to get angry, just tell the teacher, ‘Can I go see Mr. Higa?’ And so we worked out a plan. Within a week, she said, ‘You know, I’m not going to do that anymore.’” And she didn’t, Higa said.